Technology is key to getting the most out of organizational performance. 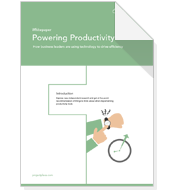 Almost all business leaders (96%) believe technology helps drive up organizational efficiency. Companies measure ROI through time saved and productivity gained, rather than in pure financial terms. The report reveals interesting differences between several regions. But two countries stand out in particular: the US (most tech-driven) and the Netherlands (least tech-driven). In this paper you'll explore new, independent research and get a five-point recommendation of things to think about when evaluating the ROI of productivity project management tools. In May 2015, research was conducted among 515 senior and key decision makers involved in IT buying processes. The study was commissioned by Planview and carried out by Loudhouse, an independent research agency in London.